Heat oven to 350°F. Lightly spray fluted tube cake pan with cooking spray. In large bowl, stir together dough ingredients until well combined. Transfer dough to lightly floured work surface. Divide dough into 24 pieces; roll each piece into a ball. In small bowl, stir together brown sugar and 2 teaspoons cinnamon. Dip 10 balls of dough into 1/2 cup melted butter, tapping off excess; roll in brown sugar-cinnamon mixture. Place coated balls in single layer to cover bottom of pan. Spoon half of the strawberries over layer of dough. Dip 10 more balls of dough into butter and coat with brown sugar-cinnamon mixture; arrange in single layer over strawberries. Top with remaining strawberries. Dip remaining balls of dough into butter and coat with brown sugar-cinnamon mixture; arrange in layer over strawberries. Meanwhile, in small bowl, beat together glaze ingredients until smooth and creamy. If necessary, add more powdered sugar or milk to create a smooth, thick glaze. Remove bread from oven; cool in pan on cooling rack 5 minutes. Place serving plate upside down over pan; turn plate and pan over. Remove pan. Top warm bread with cream cheese glaze. Serve immediately. 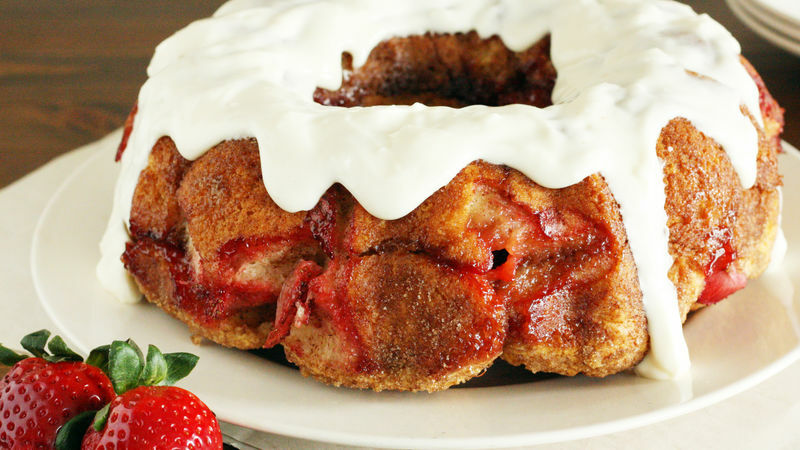 Monkey bread is best served the day it’s made, but if you want to store it and serve it another day, keep it covered, unglazed, in the refrigerator for up to two days. To reheat, place in 200°F oven until thoroughly heated. Top with glaze. Don’t fret if the cream cheese glaze is initially too thick when you spoon it over the bread; it’ll spread and melt into a more even layer as it settles.